It’s been over three decades since the last non-Power 5 program won the the national championship in college football. The Power 5 is made up of the biggest and most popular conferences the SEC, Big Ten, Pac-12, Big 12 and ACC. The Group of 5 are lower-level schools in Division I NCAA FBS football. They consist of the Sun Belt, Mountain West, Mid-American and American conferences. These schools, while still Division-I, aren’t as large nor as profitable as their Power 5 counterparts. The Power 5 teams consist of the most recognized and profitable schools such as Alabama, Clemson, Oklahoma and University of Southern California. The Crimson Tide alone are worth $930 million according to a study done by the Wall Street Journal in 2017. In 1984, Brigham Young University won the championship representing the small Western Athletic Conference and remains the only non-Power 5 to win the championship. The Western Athletic Conference discontinued football after the 2012-13 season. The division between the Power 5 and Group of 5 has grown. Not one Group of 5 team has qualified for a national championship berth since BYU and the most play in the least import bowl games. Many who dispute that a Group of 5 program should get into the playoff have claimed that it would be more or less a handout. Joel Klatt, a college football commentator is one the many people who share such sentiment. During the 2018 season, Central Florida completed their second consecutive undefeated regular season (11-0), but they still weren’t given serious consideration for the playoffs mainly because they are not a Power 5 program. Central Florida, while being in a Group of 5 conference, still throttled Power 5 programs such as Auburn and Pittsburgh. “I can see this gonna be a common theme for the rest of the year everyone who is a UCF fan is gonna complain about college football and say it’s unfair and they want a handout,” Klatt said. Central Florida is not the only Group of 5 program to not be taken seriously due to being in a smaller conference. In 2016, the Houston Cougars beat Power 5 programs such as Florida State and the Baker Mayfield-lead Oklahoma Sooners. With the widening division between the programs, some Group of 5 schools have explored the possibility of having their own playoff, exclusive to Group of 5 conferences. Schools such as Georgia State, Central Florida, Boise State and others could not only have a shot at a championship, but also have the eyes of the nation solely on their school. Georgia State, a member of the Sun Belt Conference, would also be apart of such a movement if it came to fruition. A Sun Belt would have a worse chance at joining the playoff than Central Florida and Houston. Both schools are some of the most well-known teams in the Group of 5 conferences and have a long history against Power 5 programs. Georgia State football, which isn’t even a decade old, would also be less appealing to make the playoff. Former Georgia State player Nathaniel Paxton was the team captain that lead Georgia State to its first bowl game victory in program history. The ability for smaller programs to be able to have wider appeal on national television would greatly help NFL prospects form Group of 5 schools. Georgia State doesn’t get much coverage on television, but if a playoff were created it could have the attention of the whole nation. This would also give the university more exposure as a whole if the Group of 5 create a playoff system for themselves. “I feel like the [Group of 5] deserve to show their talent just like Alabama, Clemson and all these other schools,” Paxton said. However, many players including fellow Group of 5 players have the opposite opinion when it comes to a Group of 5 playoff. 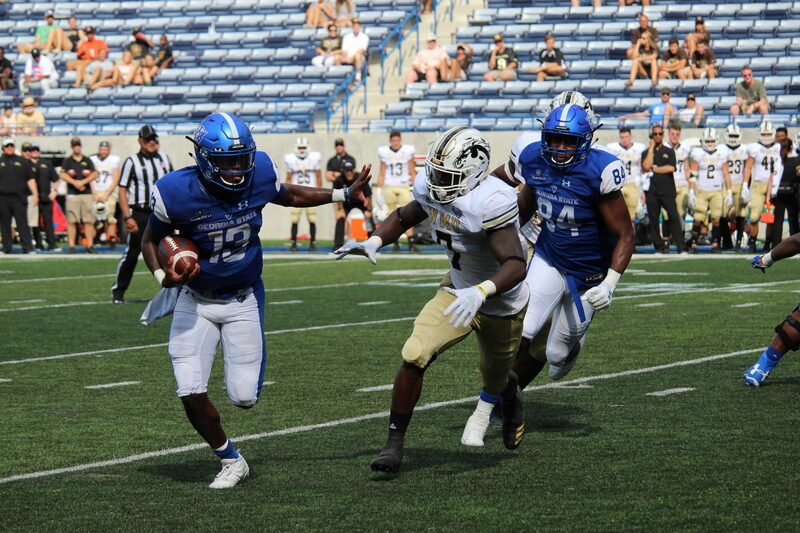 Georgia State safety Dartez Jacobs believes that the system is best as it is currently. The opinion shared by Dartez is a common one. While Group of 5 teams aren’t largely represented in huge bowl games or national championships, many do appear in nationally televised postseason games. All mid-tier bowls such as the Dollar General Bowl, Gator Bowl, Armed Forces Bowl and others broadcast many programs in the Group of 5, giving the players on their respective schools plenty of exposure for NFL scouts. Moreover, there those of Group of 5 schools that want no part of a playoff because they want the opportunity to play against Power Five programs. Former Western Michigan head coach P.J Fleck was one Group of Five coaches that was against such a proposition. Fleck’s point was also benefits Group of 5 programs to be doubted as it makes the reward of beating a Power Five program even better. The widening divisions of between Group of 5 programs and the Power 5 aren’t just noticeable, but should be alarming to all college football fans. While the idea of a playoff system exclusively for the Group of 5 might now be in the cards now the continuing divisions between the programs will only fuel such an idea.